Surround yourself with credible people. Have an awesome team working on your behalf. Everything from Home inspectors, mortgage professionals, contractors, home stagers and landscapers. If you can, have them write you a brief testimonial about you. Work for a reputable company. Reputations, especially in Real Estate, are one of the most important factors to success. Get on neighbourhood committees. Not only does it prove that you are a community advisor, it portrays you as someone with ‘skin in the game’. Hopefully someone on your committee will hire you or recommend you to one of their friends. Donate your time to a charity. Nothing says ‘selfless’ than lending a helping hand. You will feel good about doing a good deed and people will always rather work with someone who donates time and effort to a worthy cause. Utilize the successes of your company. Highlight their past sales efforts in the community. Demonstrating credibility is another matter. David Hornik says that “there isn’t a clear path to earning credibility. You don’t produce a particular amount of diligence. You don’t deliver a particular number of industry reports. You don’t call or email to follow-up a particular number of times. What you need to do is be really smart and well-informed about the business (read neighbourhood) you are pursuing. Know your neighbourhood inside and out. That means knowing, with great depth, what houses sold for and why. Do what you say you are going to do. 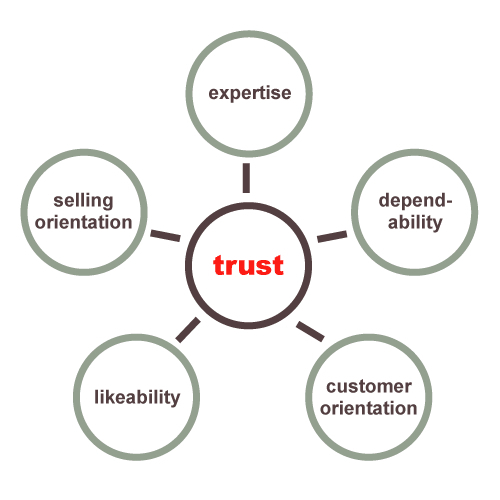 People respect other people (agents included) who respond quickly and with accuracy. Make contacts and build relationships with retailers, specialty shops, and services. Promote their products and services. The study of credibility began over 2500 years ago with Aristotle. He was interested in how the great orators communicated. He broke down the modes of persuasion into three categories. Ethos or credibility was the first modes. The other two were logos (logic) and pathos (emotion). While this is pretty interesting, the goal of any great salesperson is to lower a prospect’s perception of risk of becoming your client and increase their perception of your credibility.